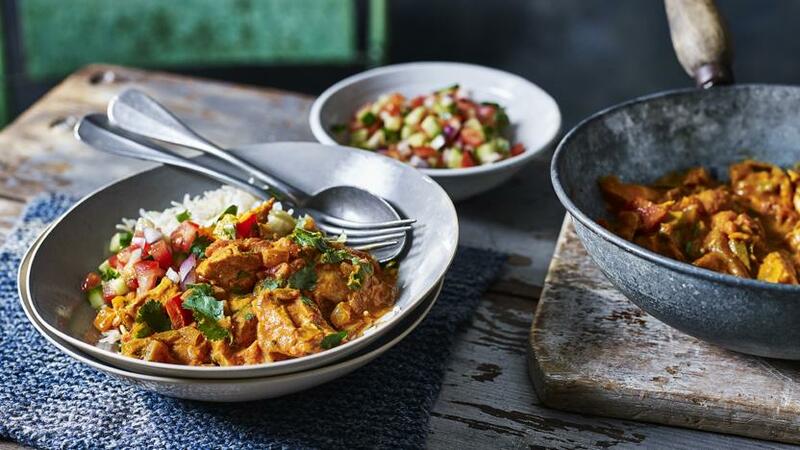 Tom Kerridge's healthier version of chicken tikka masala is a real crowd-pleaser. Leave for at least 4 hours for the chicken to marinate. Each serving provides 640 kcal, 52g protein, 88g carbohydrates (of which 20g sugars), 6.5g fat (of which 1g saturates), 10g fibre and 0.9g salt. Place the chicken in a large bowl or other non-reactive dish and slash the chicken breasts. For the marinade, mix all the ingredients together in a small bowl. Spread the marinade all over the crown. Cover with cling film and place in the fridge to marinate overnight, or at least 4 hours. Meanwhile, make the curry sauce. Heat the oil in a large frying pan. Toss in the onions and cook for 10 minutes, or until they are golden-brown, adding a splash of water to the pan if they begin to stick. Add the garlic and ginger with a splash of water, stir well and cook for 1 minute. Add the spices with some salt and pepper and cook for another minute. Stir in the tomato purée and cook for a further minute, then tip in the tinned tomatoes and pour in 300ml/10fl oz of water. Bring to the boil, reduce the heat to a gentle simmer and cook for 5–10 minutes. Add the chopped peppers and cook for a further 5 minutes, then remove from the heat. Take the chicken out of the oven. Carefully wave a cook’s blowtorch over the surface until the marinade has slightly blackened in places. Set aside for 10 minutes. For the katchumber salad, mix everything together in a bowl and set aside. Take the chicken breasts off the bone and cut the meat into chunks, about 2.5cm/1in. Reheat the curry sauce, then add the chicken and simmer for 5 minutes, or until the pieces are cooked through. Stir through the yoghurt and chopped coriander. Taste to check the seasoning. Serve scattered with coriander, with saffron rice, if using, and the katchumber salad alongside.